Hely Hutchinson received the award from his former boss, Hachette Livre's ceo Arnaud Nourry. As a Chevalier (holder of the award) in his own right, Nourry is entitled to invest someone else on behalf of the President of France. The investiture caps a memorable week for Hely Hutchinson, who on Tuesday formally opened Hachette's massive new Didcot distribution centre, which is named after him. Below we reproduce the text of Nourry's speech at the award presentation, which provides a detailed overview of Hely Hutchinson's life and career. "My Lords, Ladies and Gentlemen, thank you for being present here at the Institut Français for this exceptional event. It is a source of considerable pride and pleasure for me to bestow the Légion d’Honneur on Tim Hely Hutchinson. As you know, the Légion d’Honneur is a distinction created by Napoléon to pay homage to French citizens, and friends of France, who by their accomplishments have served France’s national interests or enhanced its prestige. 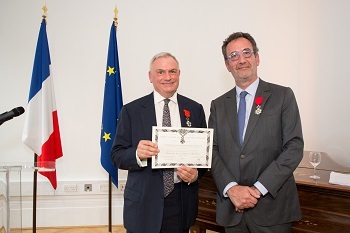 In Tim’s case the honour has been awarded for his outstanding promotion of good Anglo-French relations and his committed dissemination of international literature. Tim Hely Hutchinson’s career is, I assume, familiar to most of you. The second son of the Earl of Donoughmore, he was educated at Eton and Oxford and quickly became a successful book publisher first at Macmillan and then, at the age of 29, as managing director of Macdonal Futura. At the age of 33, he started his own company, Headline, which changed forever the standards of service given by publishers to authors. It was quickly successful, with many bestsellers, and he floated it five years later on the main market of the London Stock Exchange. a company several times the size of Headline, making the combined Hodder Headline the fourth largest publisher in Britain. In 1999, Tim Hely Hutchinson accepted a bid from WH Smith PLC, and stayed on as chief executive of Hodder Headline, chairman of WHSmith News and a director of WHSmith. He went on that year to acquire John Murray, one of Europe’s oldest and most distinguished publishing houses. In 2004, Tim engineered the sale of the company he had foundedto Hachette Livre, which is something I will return to shortly as it is not unrelated to what brings us together today. occurs in the week Britain seems on the brink of leaving the European Community. Perverse because Tim Hely Hutchinson is the very embodiment of the notion that the destinies of Britain, France and Europe more widely are entwined and cannot be separated culturally or emotionally, politics notwithstanding. I think it is well known that Tim has been a fierce opponent of Brexit and he tells me he still hopes bridges will be rebuilt. To say that Tim Hely Hutchinson is a Francophile is an understatement. His parents moved to Paris while he was a boarder at Eton and then Oxford, at both of which he studied French language and literature; he would join the family in France for every vacation and partake in the family‘s Paris social life, mingling with French and British friends and acquaintances. His passion for horses, first learned in Ireland, could be pursued at Chantilly and on the racecourses of Paris. He was able to bring his French, learned much from French 19th century novels, I would say a little more up to date, as he explored Paris and many other parts of France, and indeed enjoyed our famous markets and restaurants. Between Eton and Oxford, Tim earned money for his travels by working in various jobs in Paris and Marseille. Later, his parents acquired a house on the Côte d’Azur and, for many years, Tim spent time almost every summer in that house surrounded by a constant flow of British and French friends and visitors. If it sounds like a spoilt and carefree youth, make no mistake: Tim Hely Hutchinson was no leisured aristocrat. He enjoyed his holidays, certainly, but he was also working very hard to build a career based on the assiduous promotion of his authors and motivating the teams of talented colleagues who would help him to international success. Macmillan, you weren’t expected to speak any foreign languages and a helpful approach to customers was discouraged. The idea was that they were lucky to get any of the firm’s books, if and when they were eventually delivered. Tim took no time to find out that his different approach was more productive, and he made many friends in continental Europe and especially France. investment bank whose job it was to make sure Tim was not more helpful to the French suitor than to others. We both completely ignored the chaperone, as our conversation shifted back and forth between French and English and our personalities clicked. We quickly knew not only that our businesses were a perfect fit, but also that we could work together – and even relished the prospect of working together! Tim became an unapologetic advocate for the French connection, and his enthusiasm infected his own Board of Directors. With his help, Hachette Livre won hearts and minds at Hodder Headline. All it took to cement a friendly takeover was an offer WH Smith could not refuse. When I called Tim to let him know we had signed the contract, he was overjoyed. 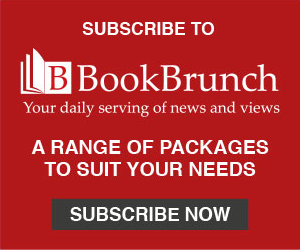 With that acquisition, it must be stressed that Hachette Livre, a French company that was founded in 1826, took its first major step towards becoming an international player, and a significant amount of the credit lies with Tim Hely Hutchinson. At my behest, Tim stayed on as chief executive of the newly formed Hachette UK, leading the Hachette companies here and in the Commonwealth to dramatically new heights, attracting a dizzying array of bestselling authors and making acquisitions of over twenty new publishing houses, which propelled the company to the number one spot in British publishing for some years. We were eventually only the second largest after Penguin merged with Random House, but still 'the best' according to the industry’s leading journal, The Bookseller. Eventually our most important acquisition together was in 2006, when Time Warner Books was put up for sale. Hachette entered the beauty contest and I partnered with Tim in order to maximize our chances. We spent an exciting, but exhausting month in New York, in total secrecy, winning the deal. Tim’s work with all the people concerned, as well as his technical experience, was instrumental in securing one of the biggest international houses to come on the market in three decades. And if only by helping Hachette, as the leading French publisher, to take that critical second step towards becoming a leading international publisher, Tim more than earned his status as a Français d’honneur. Tim Hely Hutchinson, au nom du Président de la République, et en vertu des pouvoirs qui me sont conférés, je vous nomme Chevalier dans l’ordre de la Légion d’Honneur."